Today I realized that My jewellery is my another love that I keep collecting & than giving away to my sister or sister in law and sometimes even friends, I just can't say NO whenever someone asks me for anything that's my weakness. 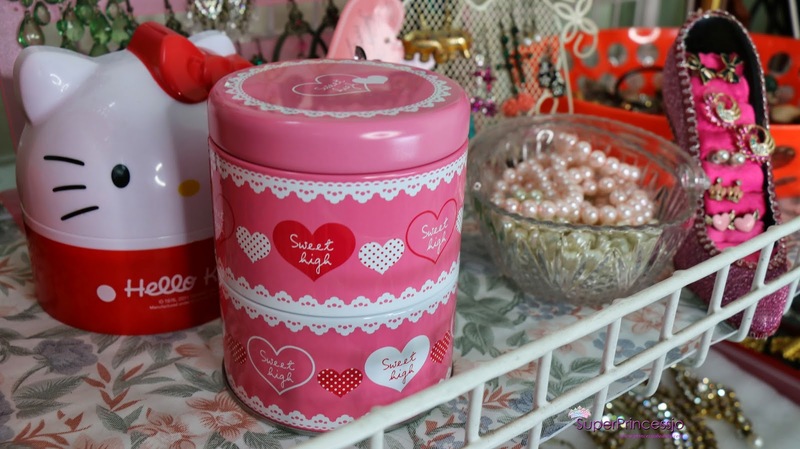 I have already shared my Jewellery collection & Jewellery storage tips before as well on my blog Read HERE & HERE. 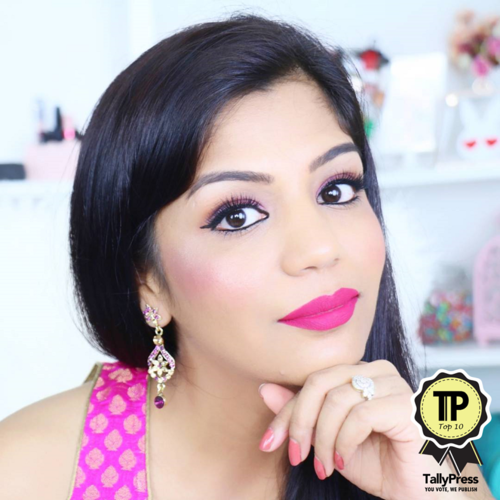 But as I don't stay in one place and one house this makes my Indian Jewellery Collection Storage and Organization Tips more challenging as I always strive to store jewellery and other makeup collection Read HERE , Read HERE ,nail-polishes collection Read HERE and lipsticks collection Read HERE in budget . There is no point for me to invest in a wooden expensive storage system as I know I will be shifting again from this country soon and everything will be left behind and that would be utter waste of our hard earned money. Instead I would rather save for future and some better things in life and use my senses to go budget friendly yet be organized,neat and clean.So when I leave this place it won't ache much in my heart of wasting money & leaving behind things. 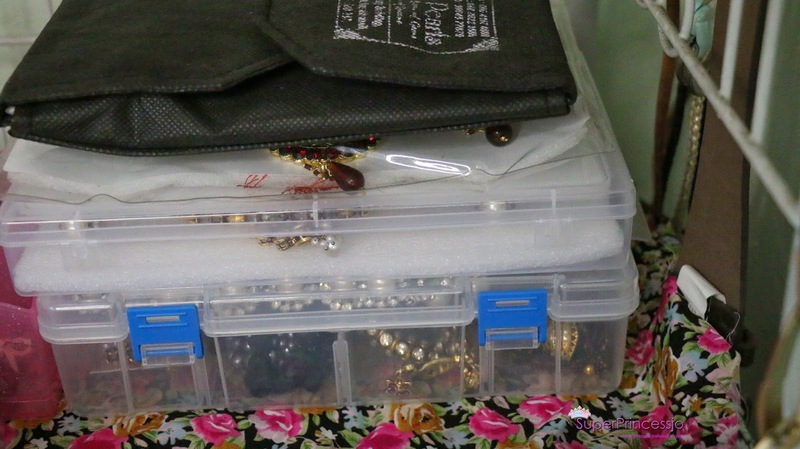 So, lets see how I organize my stuff My Indian Jewellery Collection Storage and Organization In Singapore currently (Budget Friendly). 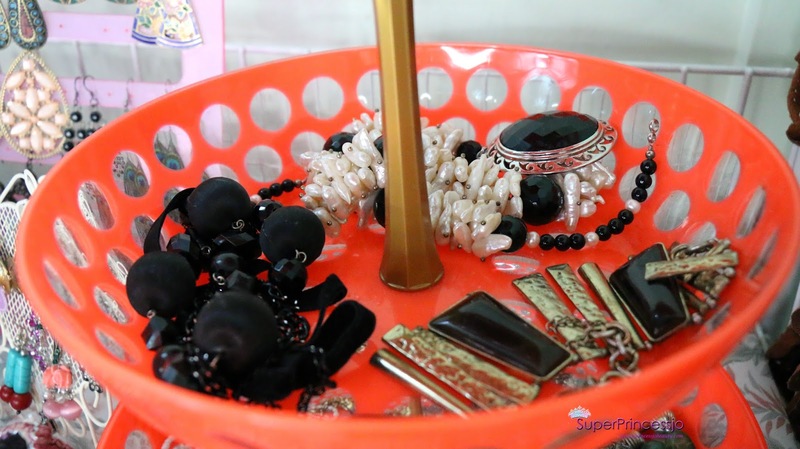 My First Row of Jewellery Organization It's the top row of my white metal Vintage white rack. 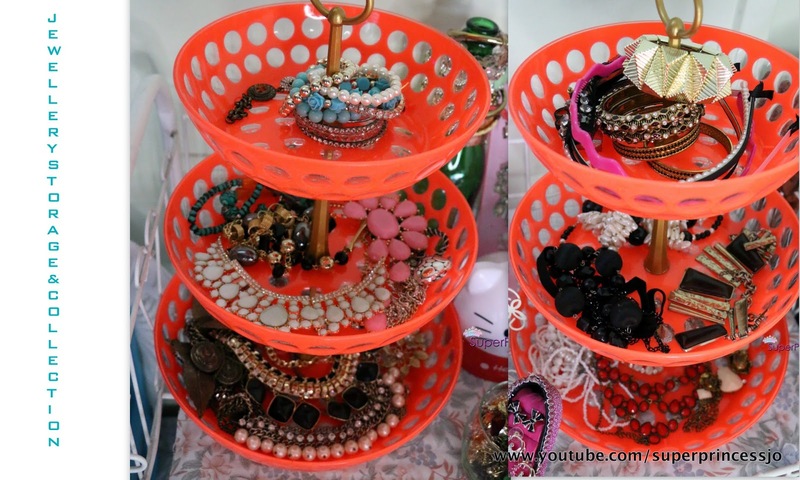 My 3 Tier Orange Plastic Organizer it can be used to store & organize fruits and vegetables In kitchen or on dinner table , I used it to organize My Jewellery. 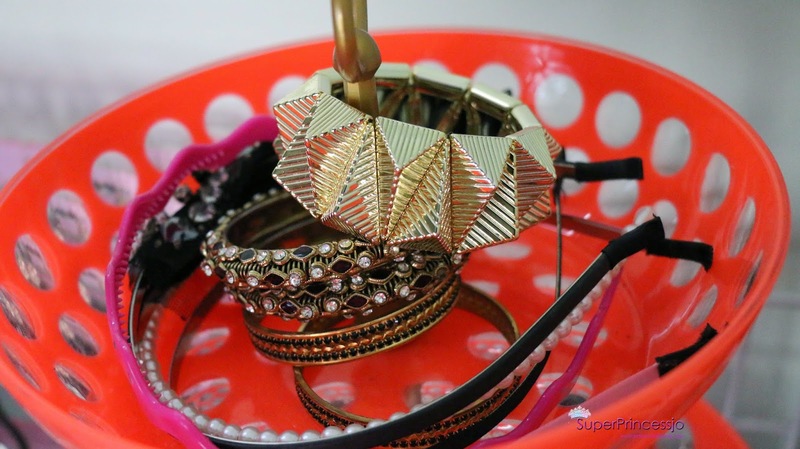 On top I stack my bracelets, below I keep all the statement necklaces. 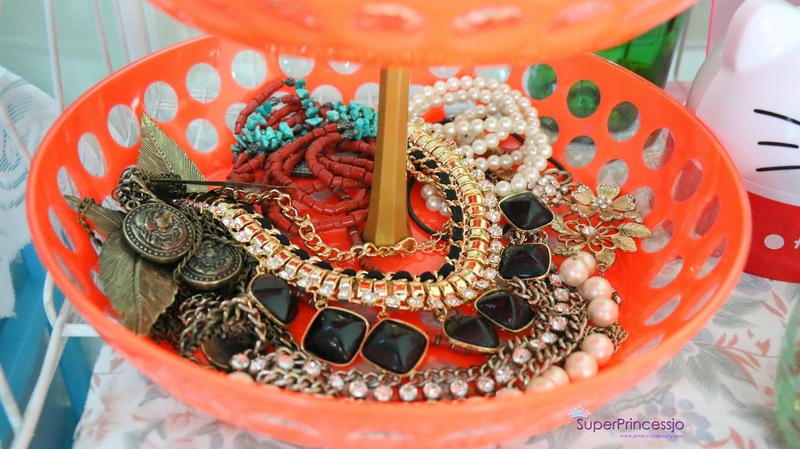 On top I stack my bracelets/Bangels, below I keep some more statement necklaces. 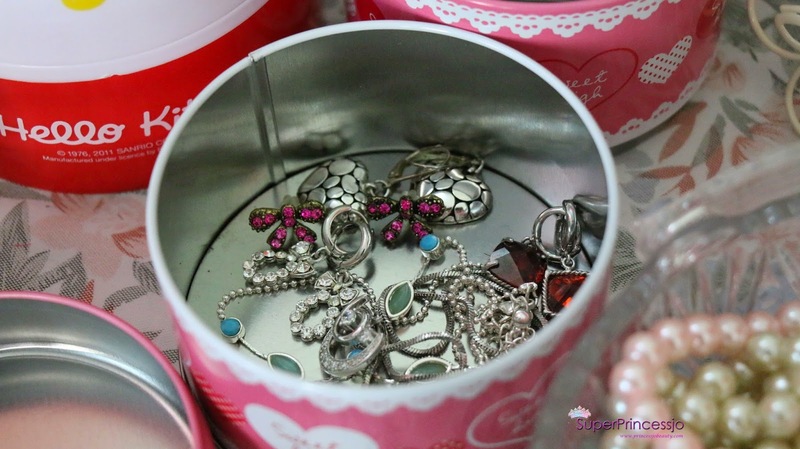 In Bottom Box I keep My cute small Jewellery that are everyday wear Jewellery and I use the most.It has some heart,bows,crystal,silver Jewellery. 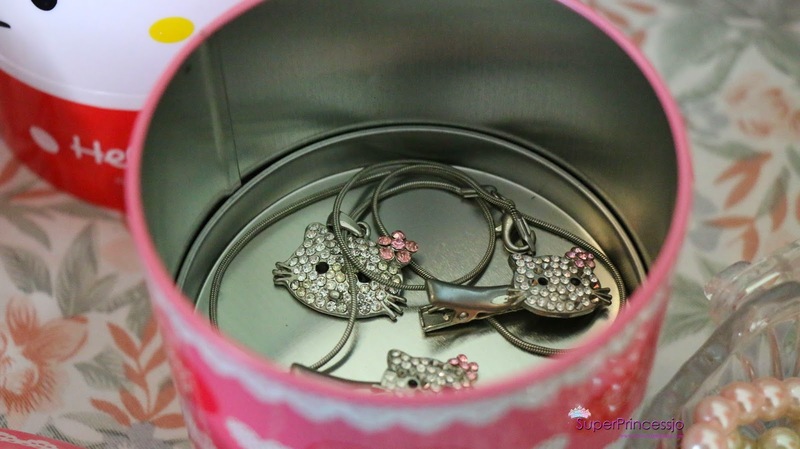 Some From Bugis Singapore, some from New York stores,some from Soufeel Jewellery. 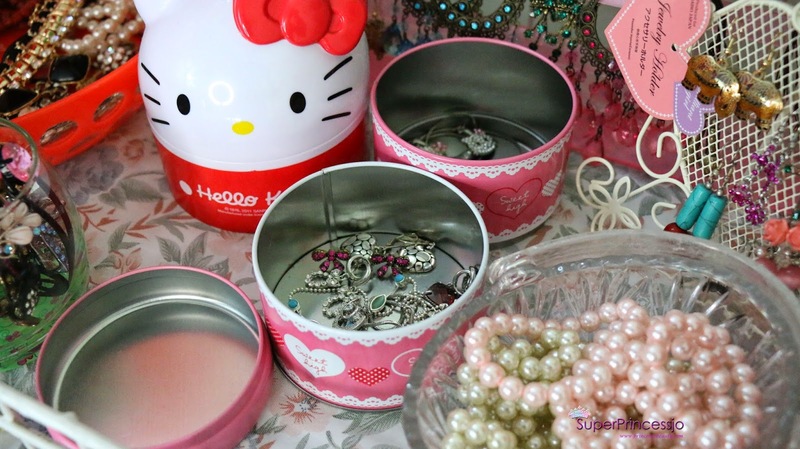 In the first top container box of Cute Pink Metal double deck /double box organizer from Daiso Japan I keep My hello Kitty Necklace and Hello Kitty Hair Clips. 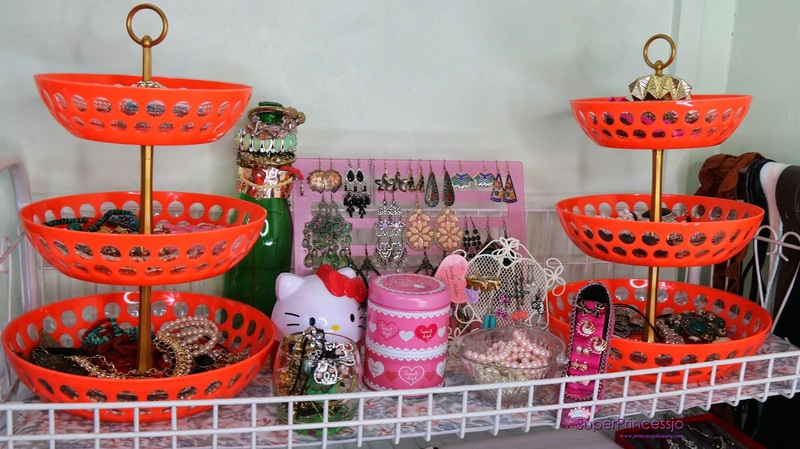 This is My Earrings Organizer /Holder, I got this Pink Plastic Earrings Holder from China Town Singapore 2 years ago. 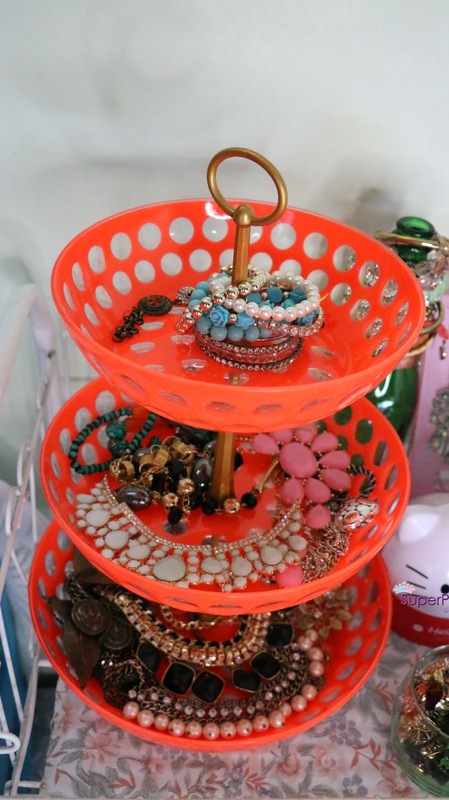 It can hang and store a lot of earrings.Only thing about this Jewellery Display or earrings holder is, it is tough to put in the earrings in the holes that the earrings holder has because the earrings may break so I hang them all on the spaces in between not in the holes provided in the earrings holder. 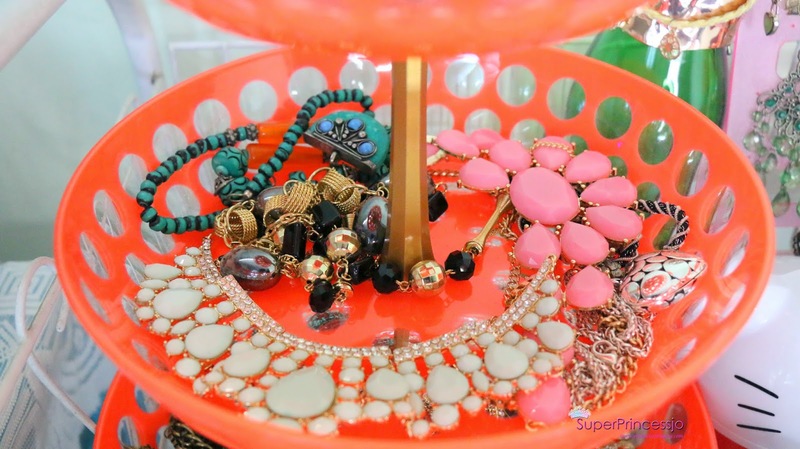 But it can display a lot of earrings & it makes my life very simple & easy as I can pick them any time quickly without any hassle & can see them all ,all the time easily. 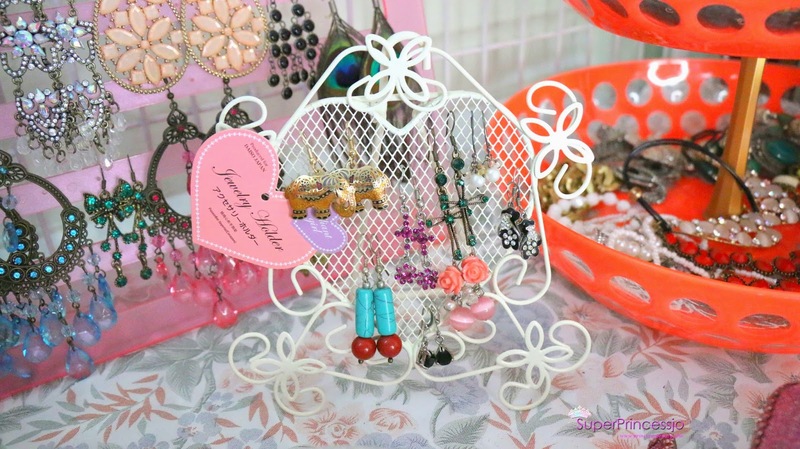 This is My second Earrings Organizer /Holder, This white metal Earrings Organizer /Holder is from Daiso Japan, I haven't taken off the heart tag from it as I like it, it is Pink and is heart shape. 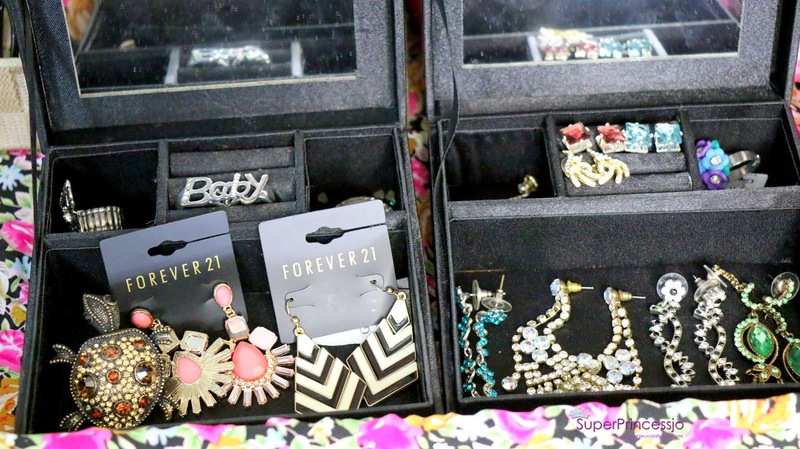 It stores a lot of small earrings and again easy to pick and choose in my everyday use for my everyday jewellery needs. 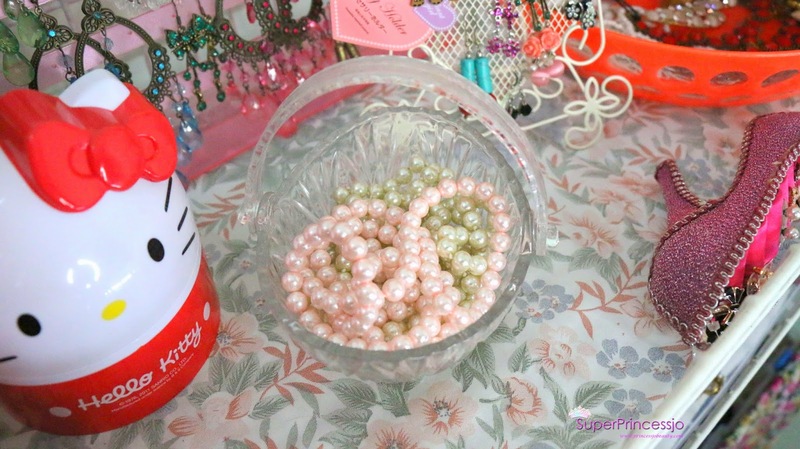 I have this crystal Glass Bowl from My Kitchen that is used to serve sugar and Fennel after dinners, But I Use it to organize my pearl necklaces I keep My white pearls and Pink Pearls necklaces In here. 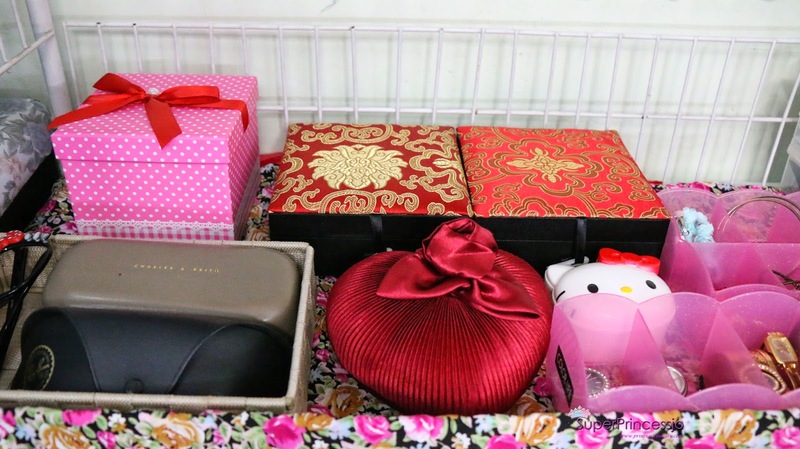 I use this Hello Kitty Storage Box that I bought Filled with candies from seven eleven Singapore, I took off the candies and I am using the storage box for storing my crystal and rose gold heart shape Jewellery set, I use this set occasionally on special occasions like dinner dates with hubby, or when we go to Family dinners or Dinner at friend's place. 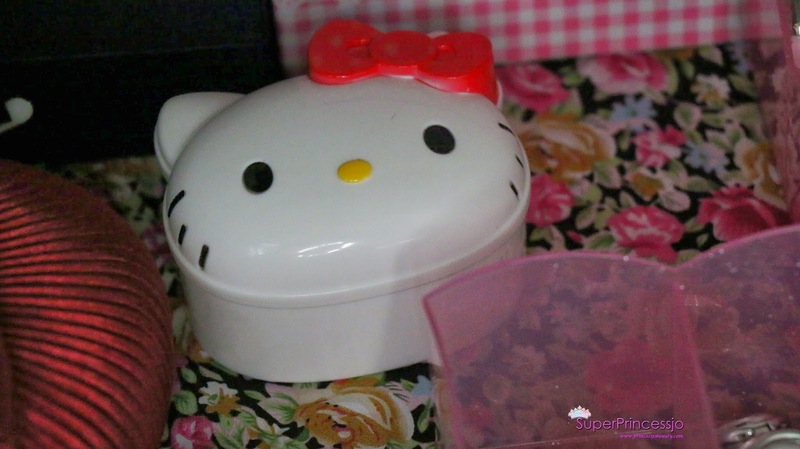 I keep this hello kitty storage box closed. 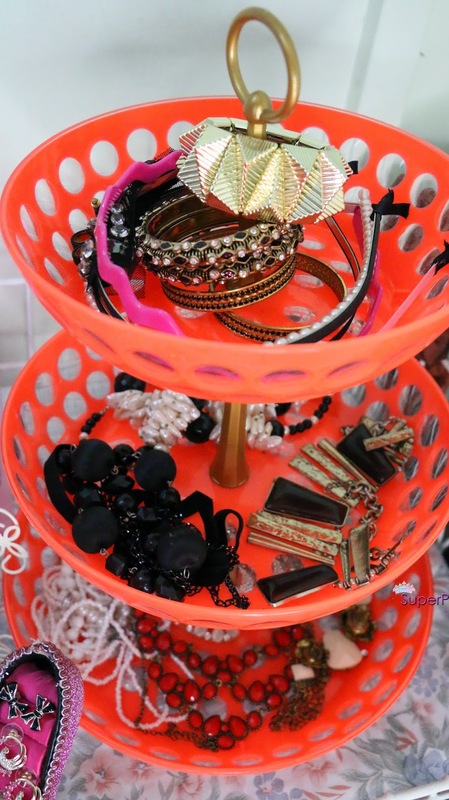 On Top Of My 3 tier storage organizer I also keep My Head bands along with the bracelets , again as its easy to pick and choose.I currently have Pink head band, Bow head band and some pearl headbands,and I use them a lot. 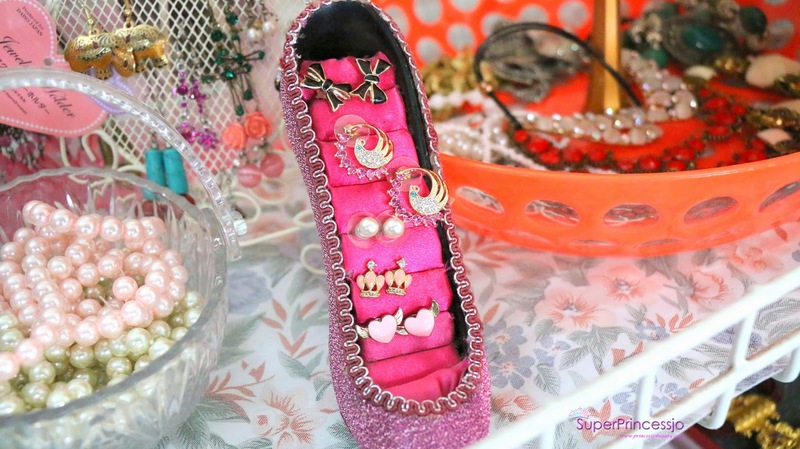 I bought the Pink shoe shape jewellery/ring holder from some online store but it store earrings better then rings so I store my everyday use small earrings in the shoe shape pink ring organizer. 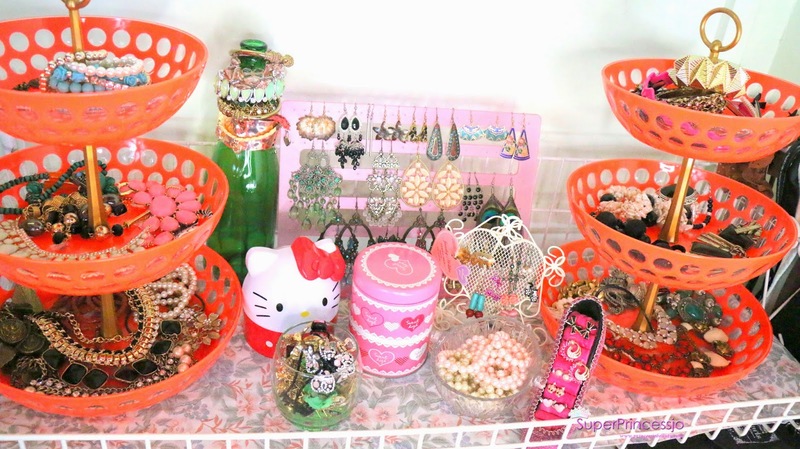 So This is How the first row of My jewellery Display ,storage & organizer looks . 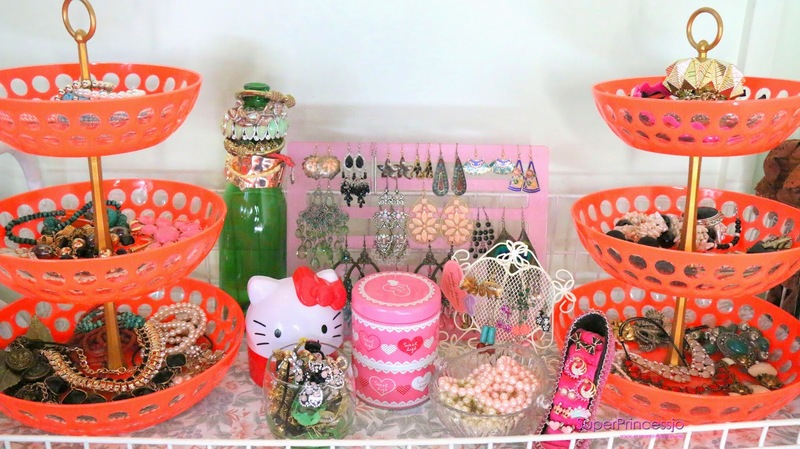 In the below pic you see the green glass bottle, That's a D.I.Y (do it yourself) Bracelet Organizer. I just washed the wine bottle & removed the sticker made it completely clean and I am using it to stack up a lot of bracelets, this way my bracelets don't go missing and I have them In display so I can choose easily. 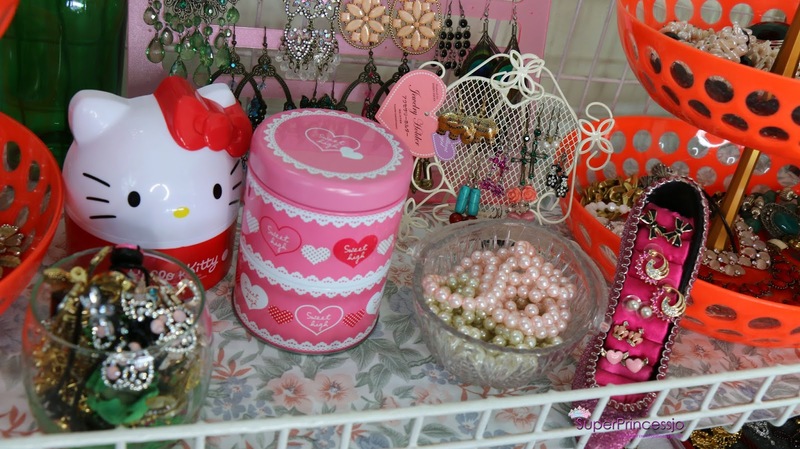 Another,Important Thing In below picture In front of the Hello kitty organizer I have a cute base Printed glass In which I store All My hair jewels / Hair crystal jewellery accessories . 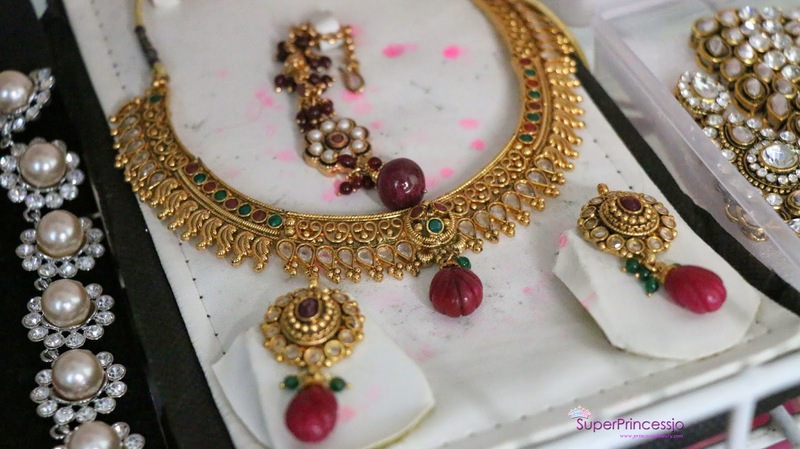 Here is the Jewellery From My Indian Jewellery Collection, I keep few Pieces with me here in Singapore ,Check below the Gold,Kundan,crystal and pearl Jewellery sets. 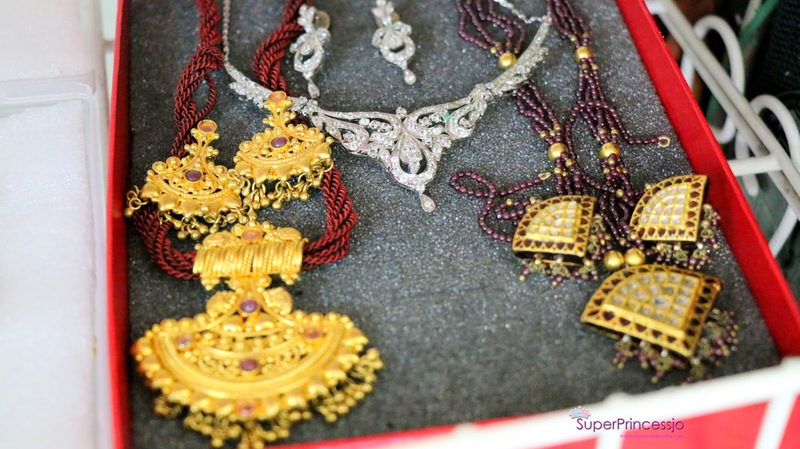 And as I displayed these Indian Jewellery Peices for you, I keep them closed In individual storage wraps and stack them on one side and open when I need them, keeps them clean and shiny. 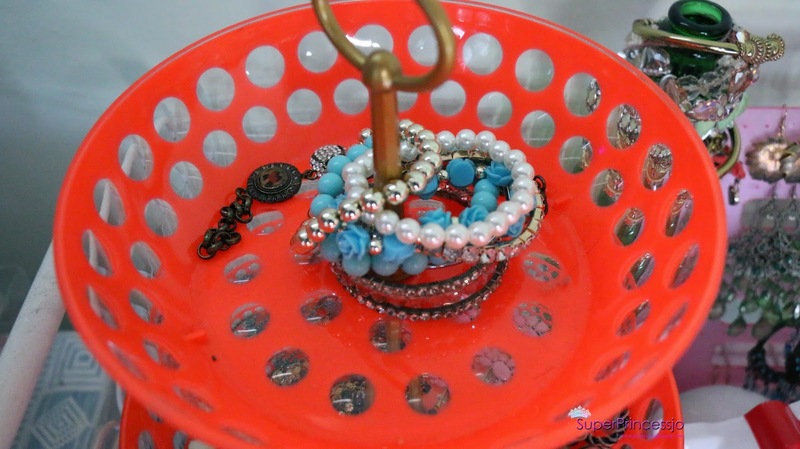 ,Chandelier Jewellery and earring peices here that I use occasionally.There are some statement rings as well in there but I do not use them often as I use My wedding ring all the time and I don't feel OK with other rings still I have a few pieces here. 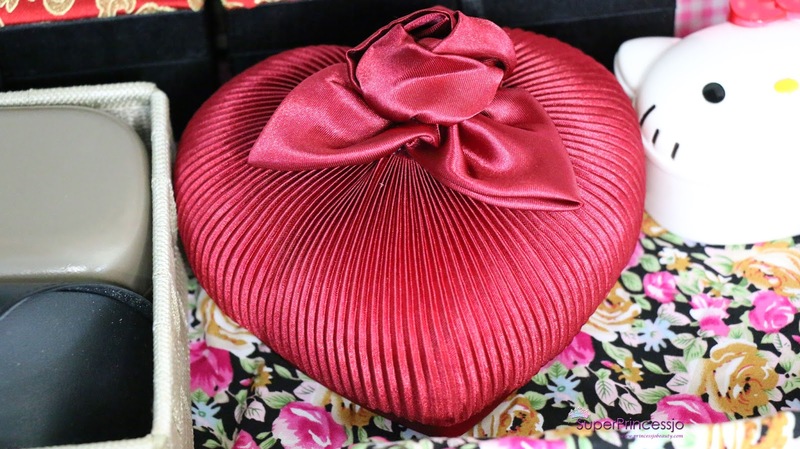 Heart Shape Satin Maroon storage box , This is one of the most favorite Jewellery organiser box I have as this has all My expensive jewellery , I love each and every peice of jewellery in there very badly. 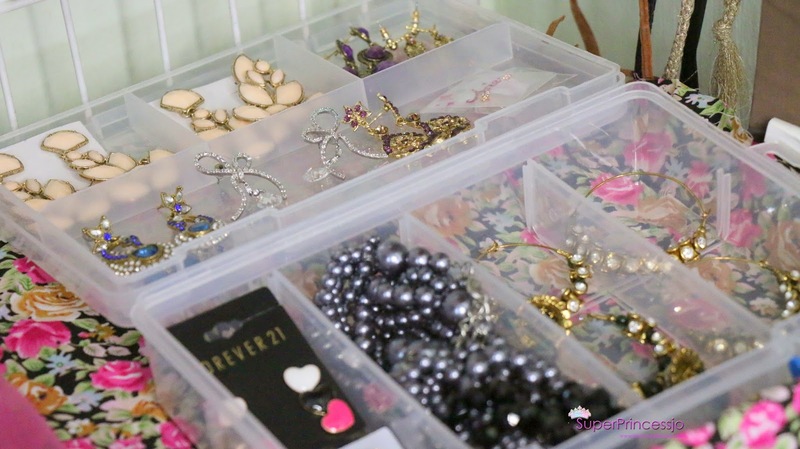 The box from a store In Singapore.I store most of my Swarovski Crystal , crystal and pearls earrings here, these are my dressy jewellery , I love them so much and wear them a lot when I get ready for special events. 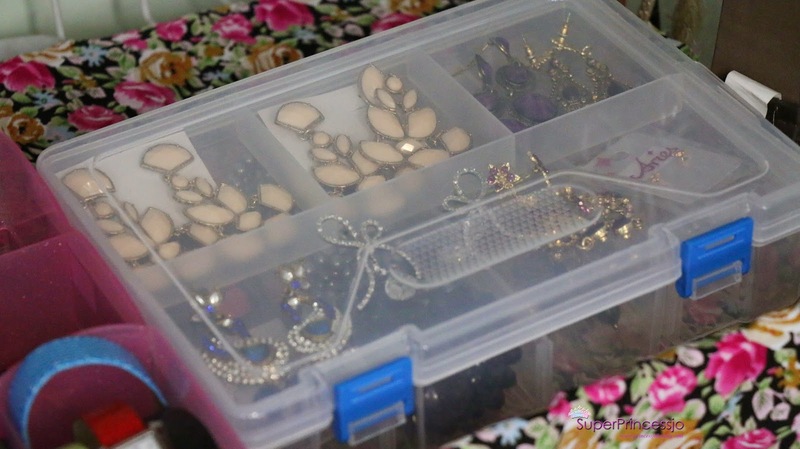 This Multi box plastic container storage box is again from a store in Singapore where you can find more home need stuffs, it has 2 compartments , once the box opens you can take off the top tray and see the below tray, so you can store jewellery in 2 trays in here that means a lot of jewellery , my huge earrings, crystals, blings, and some jewellery sets with earrings I store in here and keeps it close, these are again my special events jewellery . 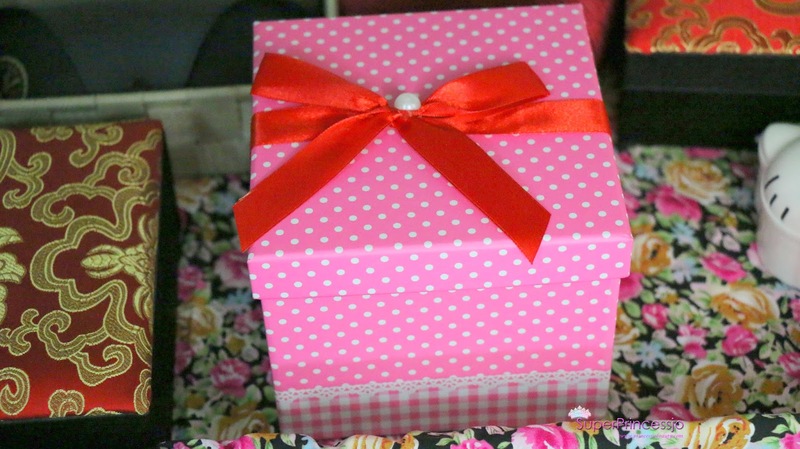 This Polka dot Pink Bow box is a paper box from Daiso Japan it stores a few of my jewellery pieces that I don't like currently. 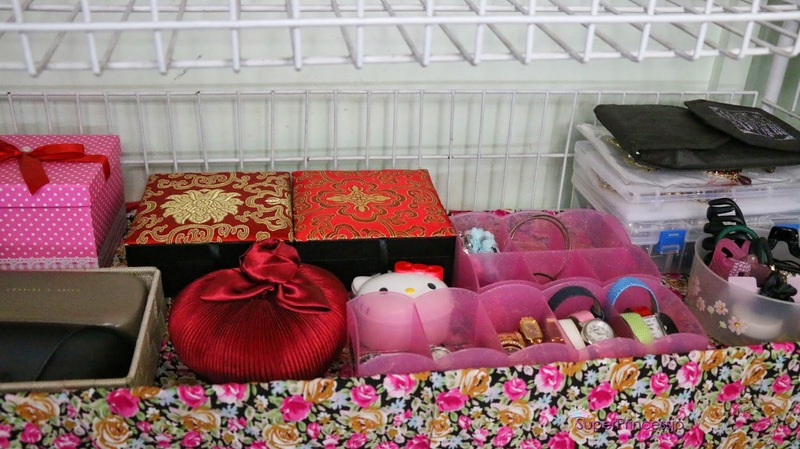 So I haven't opened this box, I just like the depth of this cute storage box it can store a lot of jewellery and looks cute, The only thing that could be better is the bow ribbon should have been pink, I just feel this red is totally out of the look. But I still like this box. 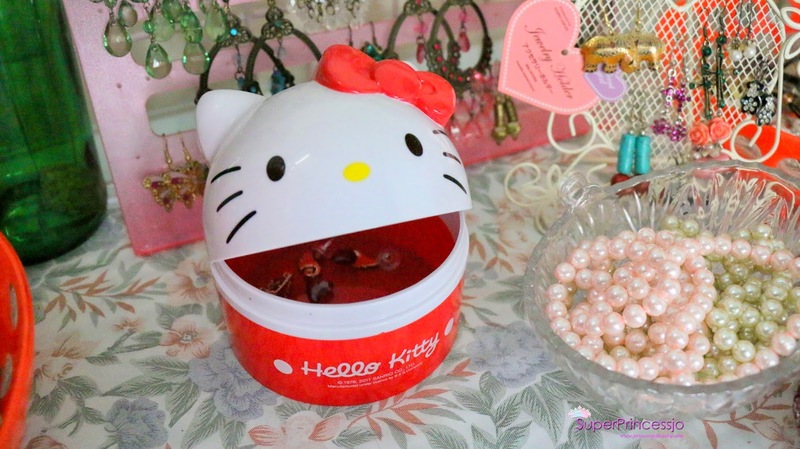 Another Cute Hello Kitty metal storage box which came candy filled and I use to store my Jewelley, I keep all my pearl earrings In here. 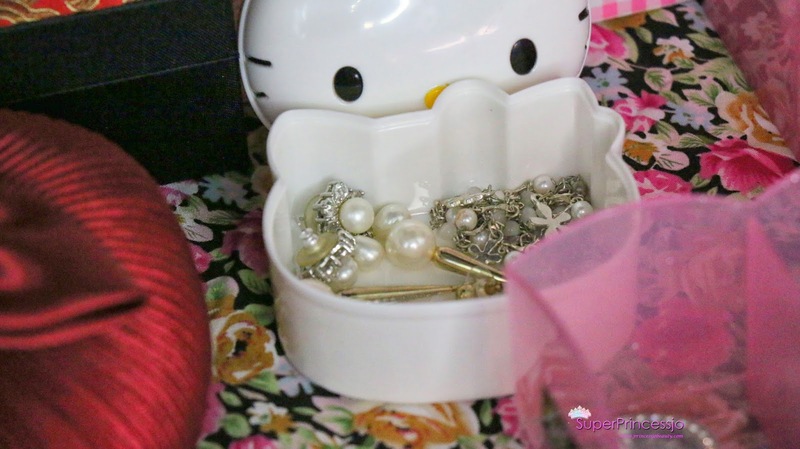 I love pearls a lot, i feel its so princessy and girly.So I have flower pearl necklace and my few pearl earrings stored in there. 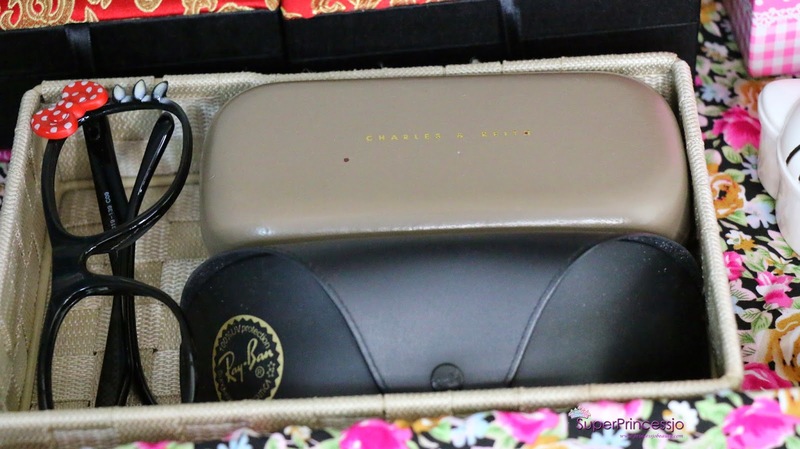 I store My Hello Kitty Glasses & My Charles & Keith sunglasses and Ray Ban goggles in a Daiso Japan storage tray . 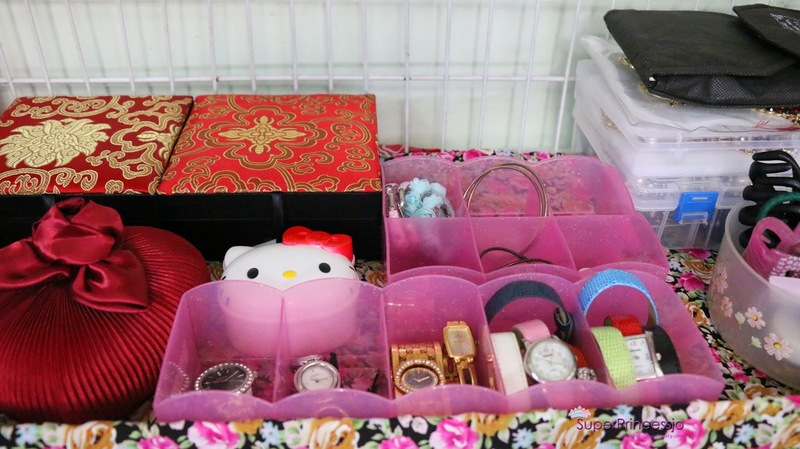 I keep My watches In The Pink cute Plastic storage tray from Daiso Japan which has multiple compartments/boxes ,From left to right, It has 2 fossil, 1 Gucci & 1 Titan and 2 kerastase watch with multiple changing watch straps. 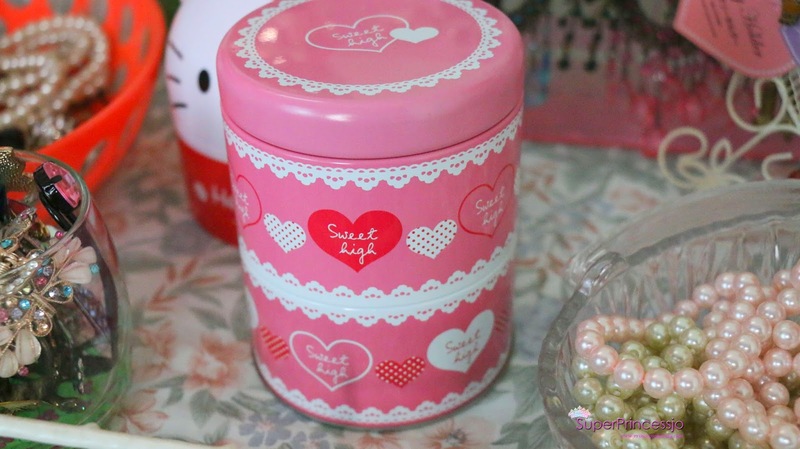 Behind this is another 6 boxes/compartments Daiso Japan box in which I keep My hoop earrings , hoops earrings are my another love. 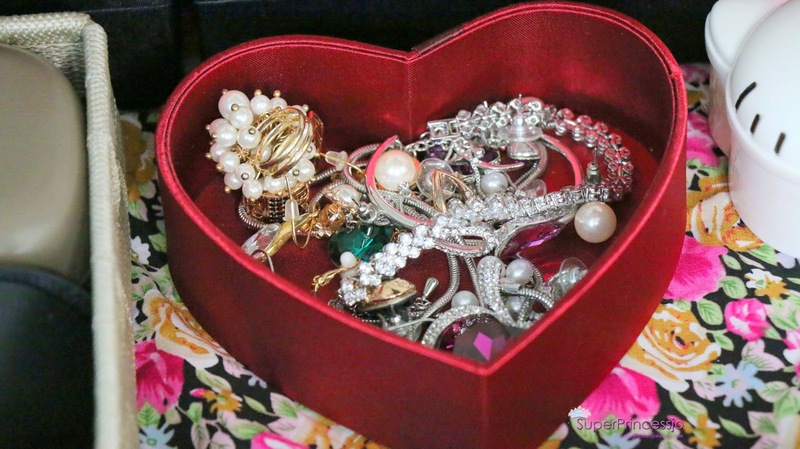 After closing all the Jewellery storage boxes this is how the second jewellery storage row looks. I hope you guys enjoyed this post and this will helps you in some way. 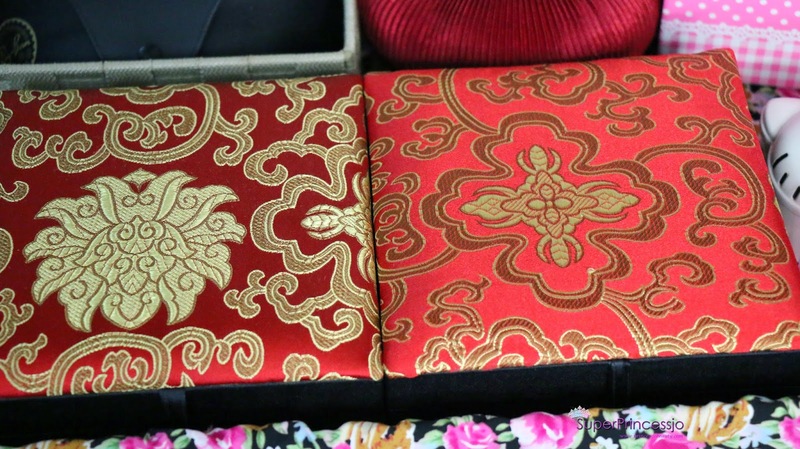 What are your storage tips & ideas? would love to hear from you..
Those collection are beautiful. 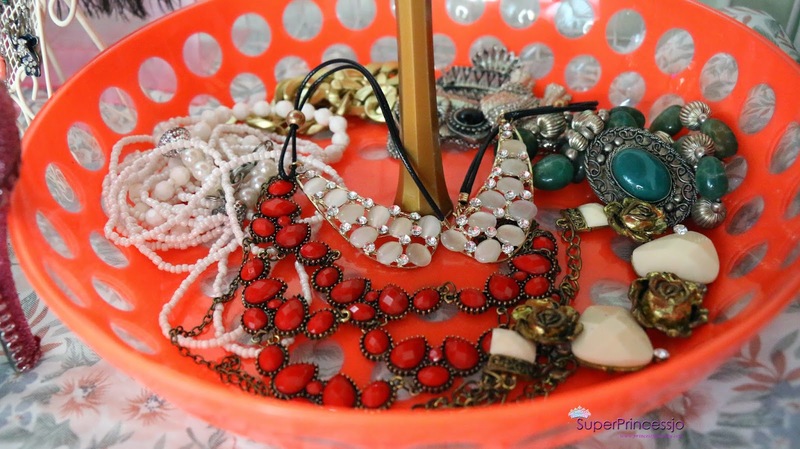 I loved every bit of that jewellery. 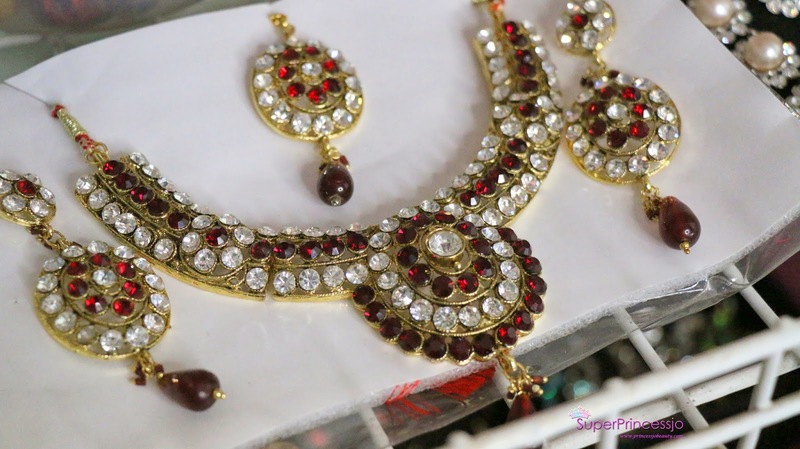 You can also check out Classic Traditional Jewellery I have seen online. How that will be helpful for you. 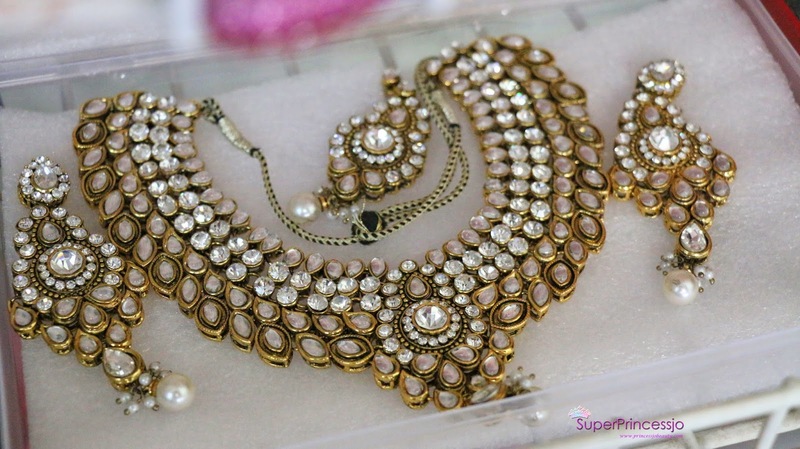 This Diwali I'm going to have shopping of a wide range Indian jewellery online! Thanks for the idea dear.